While sailing with his friend off the coast of the Canary Islands, a man named César Espino spotted a tangled whale just below the surface. 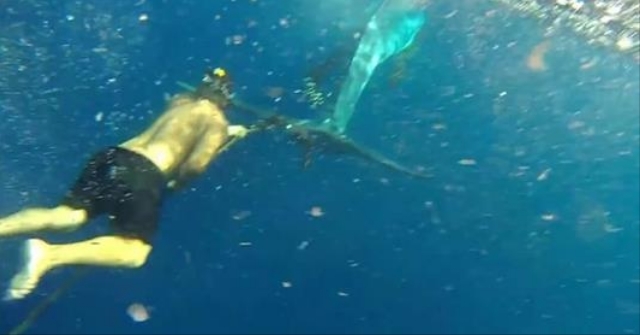 Equipped with nothing more than a knife and a pair of goggles, Espino dove into the water to assist the struggling whale. The rope, which one report said was an illegal fishing net, wasn't just holding the whale in place. It had also been digging through his skin, which in the past has even caused some whales to lose their tails. Between cutting away at the thick rope and trips to the surface for air, Espino took over an hour to free the whale. Eventually, Espino succeeded, and the whale was cut loose. The video, which has been shared over 30,000 times in just one day, shows the whale giving Espino a ride the moment his tail is free. The whale is now free to swim wherever he pleases, thanks to Espino's bravery and compassion. Responses to "Diver Frees Tangled Whale Using Nothing But Knife And His Bare Hands "
ooh, that's an awesome job! excellent! wonderful!